FOR the past few months for some reason of their own, the Teen Twins have been seeking out something other than Mum to call me. Mainly I suspect because with four children in the house, the word "Mum" like any other word that you hear repeated (shouted/ sobbed/ screamed/ whined and yelled) repeatedly, has lost all meaning. And they, being as bright (manipulative) as they are, have also worked out that after 16 years I can hear the initial rumbling of an "M.." in the middle distance and deftly develop random, specific and selective deafness. "Sorry darling did you say something? I've got to worm the cat/ sort the washing/ clean the hamster." The Teen Twins have decided to circumvent this neat distraction ploy with a distraction ploy of their own and I have spent an entertaining few weeks refusing to respond to anything they throw at me. But stage by stage, little by little, it appears they have re-christened me Moomar. Um, not too bad you might think, but on first hearing it I was put in mind of The Moomins and thought they were snidely hinting at my similarities to a Finnish hippo (of which I have none obviously). When we established that they'd never ever even heard of the Moomins (or at least weren't admitting to me that they had) I quite began to like my new name. That'll be the dictator of Libya, despicable b*st*rd and all-round nasty piece of work Gaddafi.. Muammar Gaddafi and Muammar can, it transpires, sound terribly like Moomar. I pointed this out to the Teen Twins. You can't call me that, I said. It makes me sound like Gaddafi, I said. They didn't say much except "Weeeelll.." and give knowing smirks. They're still calling me Moomar. Ha ha, mine haven't quite moved to these lengths yet....I'm sure it won't me long! 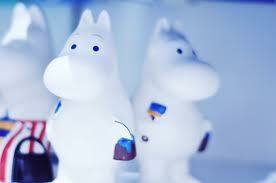 Moomin mamma - I remember her well!